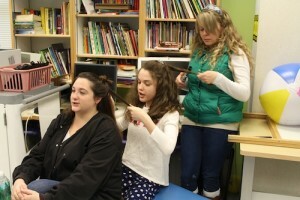 Student Katherine Gaudio gets into the spirit by styling speech-language pathologist Emily Teed’s hair, while speech-language pathologist Sara Pisarchik works on hers. Andrea Szott, whose son, Shane, is a resident at Matheny, organizes an annual Day of Beauty for female students and patients. 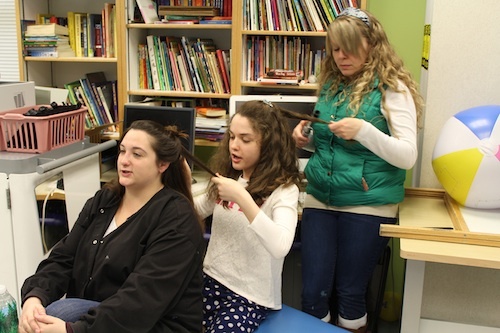 Volunteers from the community and Matheny staff members set up stations for haircuts, hair coloring, manicures, and hand and shoulder massages. Tea and snacks are served, and Matheny students and patients get an opportunity to not only meet people from the community but also to socialize with staff members in a relaxed, informal atmosphere. It’s another example of how Matheny tries to enhance the lives of people with disabilities, providing them with as many typical life experiences as possible. Volunteers are always needed at Matheny to serve as recreation assistants, classroom aides, tutors or just friendly visitors. For more information, call 908.234.0011, ext. 282, or email volunteers@matheny.org. 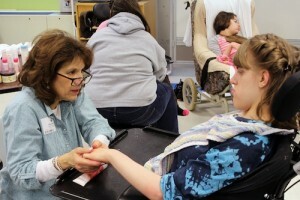 Volunteer Renee Bloom gives a hand massage to student Tammy Boszczuk. This entry was posted in Uncategorized and tagged Andrea Szott, Day of Beauty, volunteer. Bookmark the permalink.